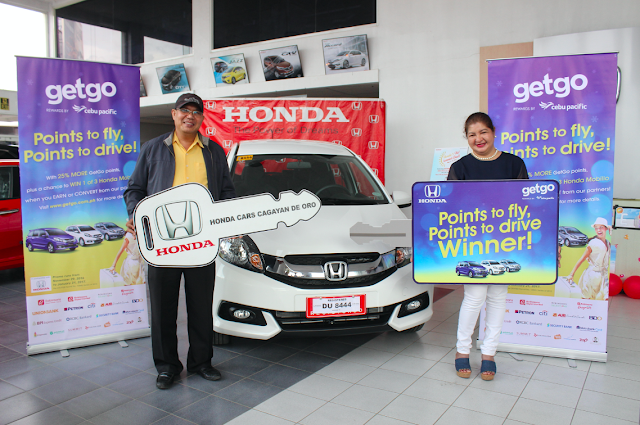 GetGo promo winners drive home brand-new Honda Mobilio vehicles - Hello! Welcome to my blog! Jeane Maravillas Regondola thanks GetGo and Honda for the unexpected reward of a lifetime. Three lucky GetGo members got more that what they asked for. Not only did they earn the points to fly for free but they also got to drive a brand-new Honda Mobilio for free. 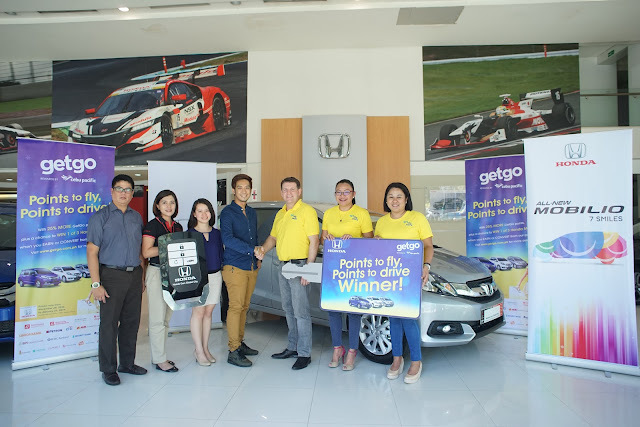 Andrew Del Pilar, Janna Leah Dans, and Jeane Maravillas Regondola just converted their loyalty points to GetGo points and was rewarded big time when they won a brand-new Honda Mobilio car in GetGo's "Points to Fly, Points to Drive" raffle promo. Janna Leah Dans poses with her brand-new Mobilio car inside the Honda showroom. “I converted my Citibank credit card points to GetGo points to avail of free flights for an upcoming family trip to attend one of my best friend's wedding,” recalled Janna, a GMA Network project manager. “This is the first time that I used my points to get free flights,” admits the GetGo member who converted the credit card points she earned in the last 8 years. For Jeane, a 54-year-old accountant, transferring her Citibank Gold credit card’s earned points to her Citibank Cebu Pacific credit card was instrumental in her winning, especially since the points were transferred on the last day of the promo period. 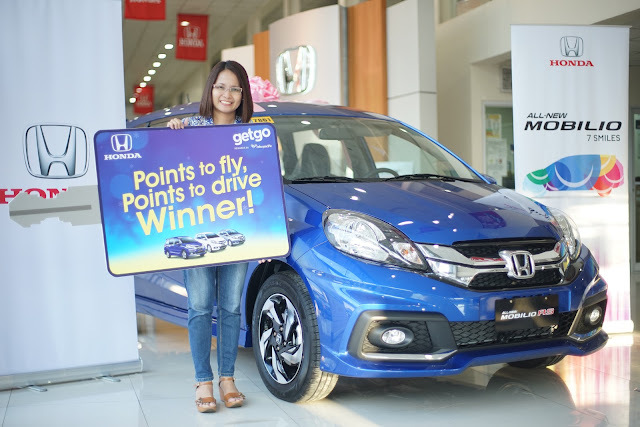 “I am very thankful to GetGo and Honda for this wonderful experience of winning this amazing and stunningly beautiful car,” said Jeane who hinted at giving the Honda Mobilio to her only daughter, Hazel. Andrew Del Pilar (4th from left) quickly fell in love with his new car which he christened ‘Imman’. and representatives from GetGo and Honda. It was a different story for Andrew who initially doubted news that he won a Honda Mobilio. “I didn’t believe it! I thought it was a scam until I saw the official post from Facebook,” said the 27-year-old bank employee who admits to being a loyal customer of Cebu Pacific ever since he started travelling 5 years ago. A GetGo member since 2015, Andrew makes it a point to travel to different Cebu Pacific international destinations using his GetGo points which he strives to earn the quickest way possible, including joining the “Points to Fly, Points to Drive” promo. Once, he even took advantage of a “double the points” promo, which for him was the best deal ever. Aside from raffling off three Honda Mobilio vehicles, the GetGo Points to Fly, Points to Drive raffle promo also gave away 25% additional GetGo bonus points to encourage members to earn and convert their rewards points from Cebu Pacific GetGo Debit and Credit Cards, from its wide roster of bank partners, retail partners, fuel partner, hotel partners, online travel agencies, and service partners.